When I was a kid growing up in Brooklyn, I got introduced to 12th and 13th century stained glass in a Museum called The Cloisters, a branch of New York’s Metropolitan Museum of Art. It was wonderful to see the bright colors, the ancient materials, the whiff of history, the stories told by the glass. I was young, and I wanted to see the world in such a simple, idealistic, maybe even naive way. 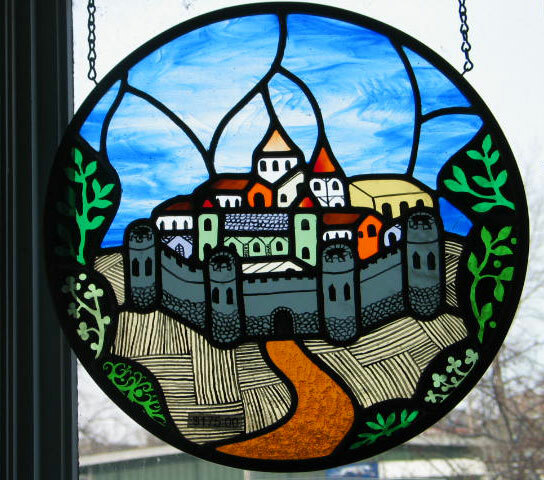 After I took up stained glass myself in 1969, I build my first kiln so I could duplicate the black trace paint which was fired onto the glass in medieval times. It is this which gives the detail between the lead lines, and I’ve used here in this panel a number of early French and English mannerisms, the orderly fields, the trees like broccoli, the perfect neat order of houses within the walls. It is my own design, and I drew it from pure imagination. Now, for the story. A young woman walked into my shop a number of years ago and looked at this medallion. “I know this place,” she said. “My mother was born there.” And she named a village in the south of France. I told her I hadn’t drawn it that way, had never been there, but she told me I had got it just right. I just smiled and sold the piece to her and made a promise to go there one day. And I did, eventually. One day a year or two later an older man born in Germany came in and looked at a panel made from the same design. “I know this place,” he said, naming a town on the Rhine River famous for its castle. But I told him it wasn’t, had not been, my idea to draw that. He was not convinced. And he was followed by an Italian fellow, who located the town in Sicily. And lately it was identified by a well-travelled American who knows exactly where it is, somewhere in Spain. I think I figured it out, finally. I think it is just an icon, a kind of an image of serenity and order and peace, of everything in its place and the colors bright and joyous. It is, maybe, just a place familiar to the heart. What makes this lamp different from the many “craftsman” style lamps being manufactured today is first of all its simplicity. 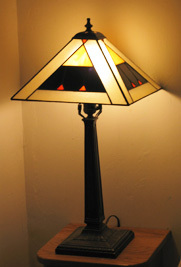 I see many other lamps made in this style that have too many small pieces of glass, which makes them look busy and not restful. When I set out to make the ideal bedside table lamp, I made four design choices. I use Kokomo pale amber cathedral glass for the borders, which I sandblast on the back side, instead of the opal glass that most lamp designers use. This lights up like parchment paper, giving a soft, warm feel and a glowing texture like tiny grains of sand. I use Spectrum solid black glass in the middle for drama, to enhance the other colors and to shield the brightness of the electric bulb placed just behind it. 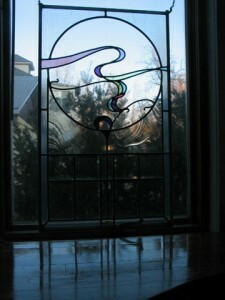 I use glass with swirls of strong mixed color for the big triangles, and can accommodate my clients’ choice of color. The two small triangles in each side are chosen to support the color of the large ones. Finally, I use a three-way bulb with 30 watts at the low end for a night-light setting and 100 watts at the high end for reading. The Mission Style metal base is the best I can get, heavy and solid, and comes equipped with a three-way turn-knob socket. The base is made in America by Handley Industries, and is beautifully cast and finely finished with an antique bronze patina. The base is U.L. approved. It is vastly superior to the cheap and rough imported castings supplied with the type of mass-market lamps found in catalogs and home-stores. Size: 12″ x 12″ x 23″ high. Light Bulb: 30-70-100 watt three-way incandescent (supplied). Price: $225.00 FOB Burlington, Vermont. 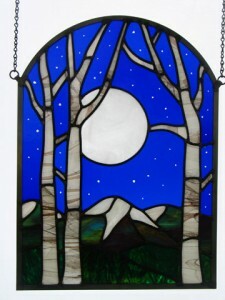 I made this panel to celebrate the color and mystery of night, and also to explore a fantasy about what kind of impression Vincent Van Gogh might have arrived at, had he been a stained glass artist living in Vermont. I only make these panels when I have on hand five fairly exotic materials at the same time: Uroboros American hand cast rippled glass for spruce and hemlock trees; French mouth-blown Antique glass which has a clear base with blue color flashed on the surface, so that I can sandblast away the blue to make the stars; Fremont American blown glass which looks to me like birch bark, and Youghiogheny American hand-rolled and acid-frosted glass which gives the parchment-like surface of the moon. The mountains are made from Kokomo opalescent number 70, a blue-green-purple combination with an eerie luminescence and a pleasant warmth. Each panel is handmade and colors may vary a little, but each one is a labor of love. Each panel bears the signature of the artist. 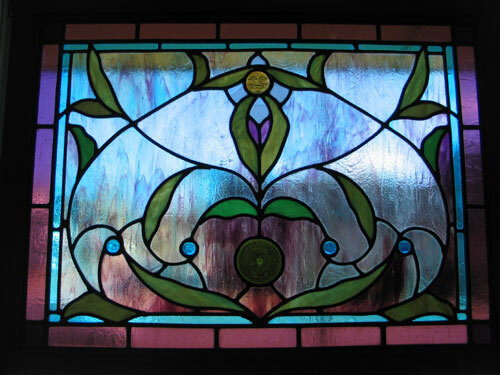 For many people, this is the style of stained glass that just feels the best. Many of the houses built in America in the late nineteenth century and at the turn of the twentieth incorporated at least one window that featured this sort of lush, spiral and foliage-driven line plan. Many of those windows incorporated textured bits of glass in the form of cast gems, jewels, mouth-blown rondels and cabochons. The historical style sits midway between the British Edwardian 1870’s and the Art Nouveau 1900’s. I’ve repaired or restored several hundred windows of this sort in my 38 year career, and what I know about this type of design is a product of that experience. Most of the old windows I’ve worked on have had various types of green glass for leaves, and reds, blues or purples for gems and other accents. The vast majority of them had a background either of textured clear glass or else of amber or honey color rolled cathedral glass. I wanted to do a few things differently here. Kokomo Glass Company makes an extraordinary material which they call 222X-LL sky blue/amber/ purple/clear cathedral glass. The difference between using a single-color cathedral glass for background and using this complex streaky mixed color for the background is like the difference between talking and singing. All of the other color decisions for this window follow from this choice. I chose blues and purples from the Kokomo palette of single-color cathedral glasses, and a handmade green rondel and four blue plano-convex gems. The moon-face gem in the top center comes from the Chicago Art Glass Company. It has a classical Greek or Roman look, smiling down out of the window like a small benign presence. I frame this panel in varnished White Oak with two strong brass hanging points. Each panel is handmade and colors may vary a little. Each panel bears the signature of the artist. Packing and shipping: $55.00; this panel is shipped double-boxed, both boxes of wood, shipping weight 80 pounds; all shipments by FedEx Ground Service, Insured. This type of vessel shares its name with the town of its origin, near Bar Harbor, Maine. The original Quaker shipwrights who founded the place moved on at the end of the 17th century, when they were driven out by their Puritan neighbors. Most of them moved to Maryland, but their heritage remains in the name of this sailing vessel. The Friendship design evolved at the beginning of the nineteenth century as a “fast fisherman”, able to take on a perishable cargo and speed back to harbor before its limited cargo of ice could melt. These were working vessels, mostly used in the lobster trade. Today, owing to the classic beauty, dignity and usefulness of the Friendship, a few original boats and many copies are still used as pleasure boats. More information can be found in Howard Chapelle’s book American Small Sailing Craft. My Friendship is made from German antique glass for the very transparent sky, and American “waterglass” cathedral glass for the sea. The sails are made of wispy translucent white opal glass. 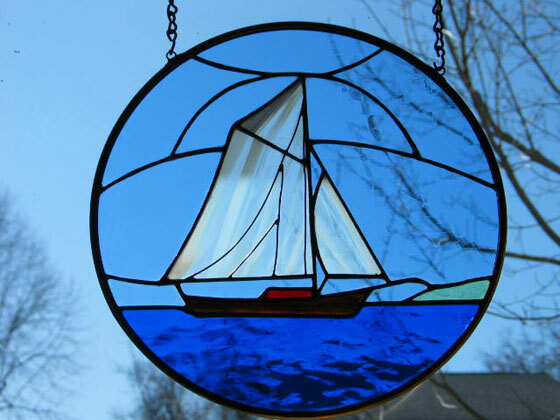 I make these hanging panels with a brass rim, just porthole sized, and I finish the metal with a copper patina to add the proper nautical feel. The fine detail of the rigging is done with brass wire. Care for this piece by putting a little spray furniture wax on a terrycloth rag and buffing it down about once a year. Or leave it unpolished and watch it slowly get green like brass on a ship. Please hang it securely, no suction cups. Small screw eyes or cup hooks are best. Hanging chain is supplied with each panel. Once a familiar sight on New England waters, coasting schooners or “coasters” carried mail, packages, goods and people to and from east coast ports. Rudyard Kipling wrote about the dangerous life of the Grand Banks fishermen who lived and worked in wooden schooners in his book Captains Courageous. Many beautiful nineteenth century examples of this type of vessel may be seen at Mystic Seaport in Connecticut, and the San Francisco Maritime Museum has several well preserved examples of schooners which used to carry lumber up and down the Pacific coast. 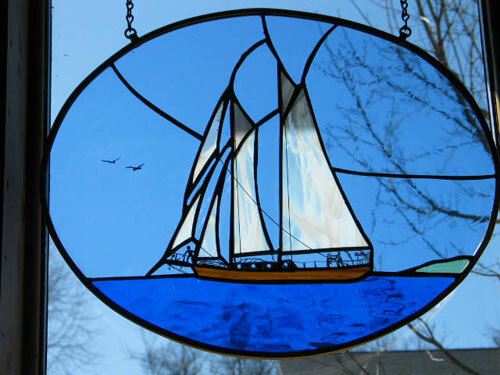 Schooner is derived, some say, from an old Dutch word for “skimmer”, meaning a fast and light vessel. The real definition of schooner rig is mainmast and big sail in the rear, with the rest of the sail carried on a shorter foremast and triangular headsails carried on a bowsprit. This “divided” rig meant that no one sail had to be unmanageably large, which in turn meant that a smaller crew could handle the vessel, even in a blow. For more on this, I recommend Howard Chapelle’s book American Small Sailing Craft. My schooner has a crew of just two, with topsails set for summer breezes. It is made from German antique glass for the sky, American waterglass for the sea, and wispy opal glass sails. The painted figures and details are kiln-fired to 1,175 degrees for permanence. I make these hanging panels with a brass rim, and I finish the metal with a copper patina. The fine detail of the rigging is done with brass wire. Care for it by putting a little spray furniture wax on a terrycloth rag and buffing it down about once a year. Or leave it unpolished and watch it slowly get green like brass on a ship. Please hang it securely, no suction cups. Small screw eyes or cup hooks are best. Hanging chain is supplied with each panel. I feel no contradiction between science and art. With this panel, I wanted to get away from classical stained glass ideas, and to express a kind of counterpoint between the rational and the intuitive. I started with a linear geometric idea in the lower section, the kind of comfortable repetitions of squares and rectangles that would have made Frank Lloyd Wright happy. I was thinking of telescopes and microscopes and petri dishes when I drew the circle up above. Some of the most beautiful, mysterious and awe-inspiring images of recent years have come from astronomers, biologists and physicists. Within the circle, I drew lines growing like tendrils, or the complex re-curving forms of higher mathematics. I chose colors that feel organic and biological, and I wanted them to float in space. The motif of a twisting ribbon is something I borrowed from the great Art Nouveau designers of the nineteenth century. The idea of continual change is implied by the fact that every time the ribbon turns over, it reveals a new color. The energy and visual momentum of the lead lines is also important. Once the eye starts to follow a line, I sometimes continue that line beyond its normal end point in a false lead, using the energy like a wave or a growing form. The clear beveled glass components will spill prismatic rainbows into the room where it is hung. 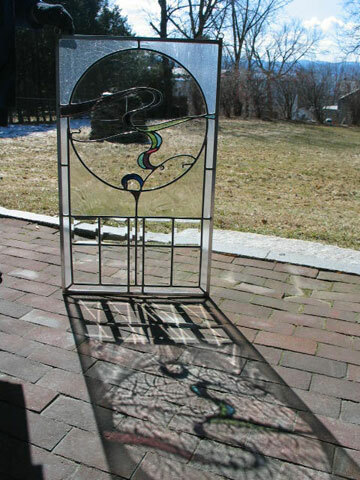 Because of the antique mouth-blown glass, the circular part of this window will project an image of itself on the floor. The panel is framed in zinc channel for a clean, contemporary look. Each panel is handmade, and colors may vary a little. Each panel bears the signature of the artist.